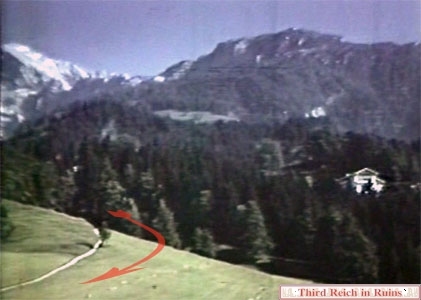 There were probably several routes to (and from) the Teehaus. 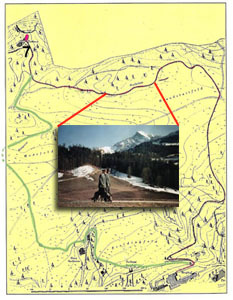 The red route which goes counterclockwise is the most known one, but some photographs (see below) show a different (green) route. 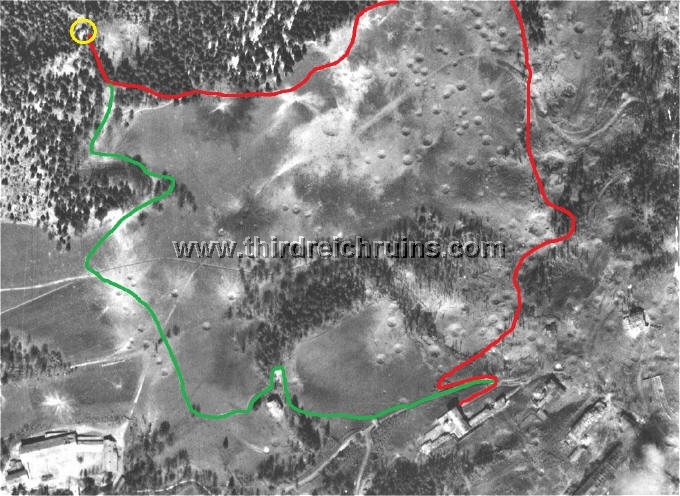 So, there were probably different "outward-" and "return routes". 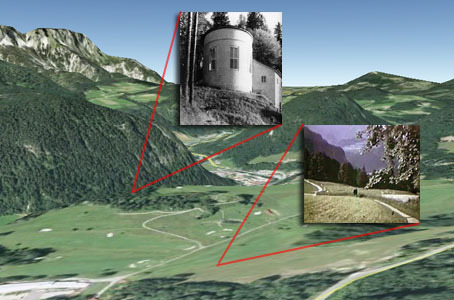 And the story goes, sometimes Hitler walked to the Gutshof where they picked him and his entourage of that day up and drove them back to the Berghof. 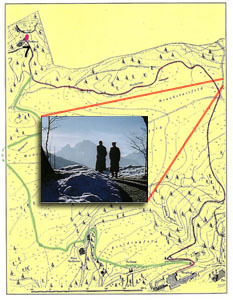 Again, bear in mind the red route differs from the modern path that one can walk on nowadays. 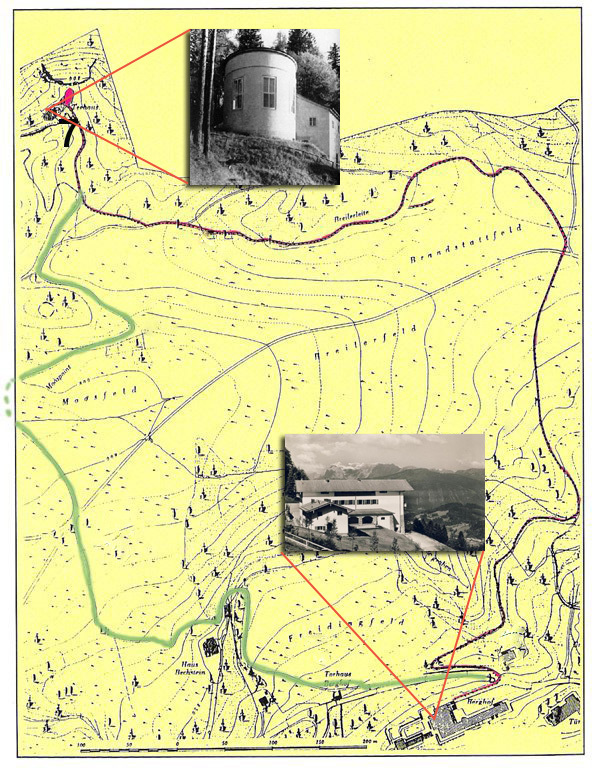 Photomontage of the old and current situation. 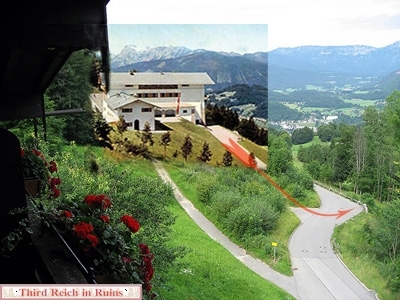 Both photos are taken from the Hotel zum Türken. 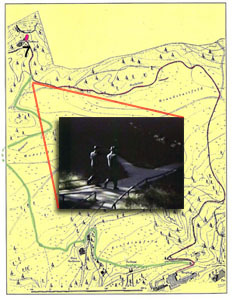 This track is no longer accessible and differs from the modern path. 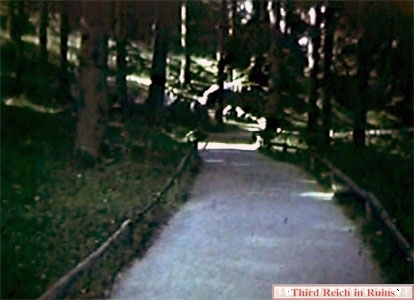 The wooden walkway that made its way down this hillside. 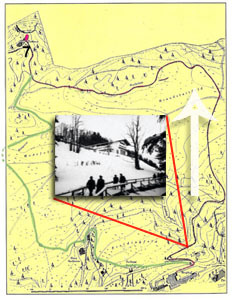 Same spot in another season. 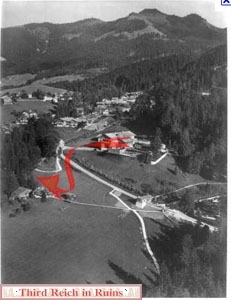 Aerial view of the two turns and the Berghof. 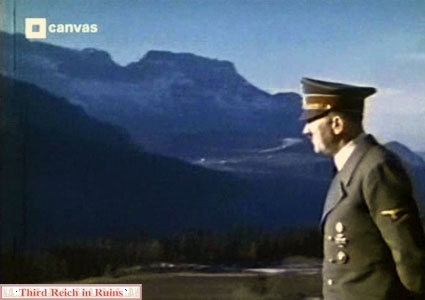 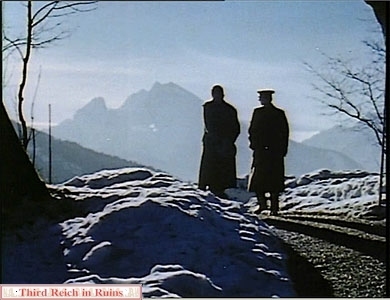 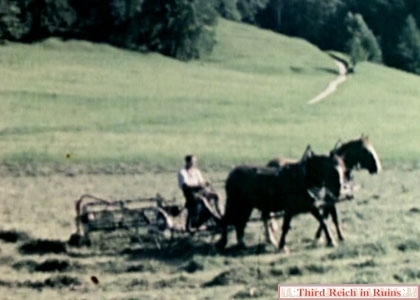 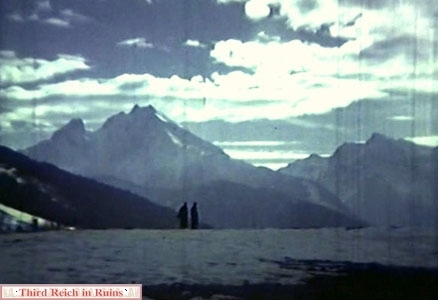 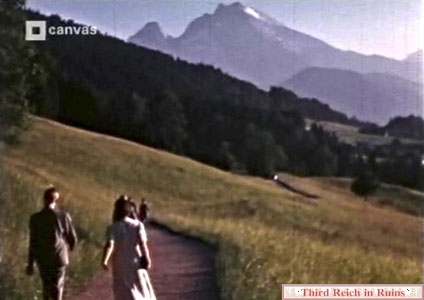 Further along this path, looking back toward the Berghof in the background (still from Eva Braun's movies in the U.S. National Archives). 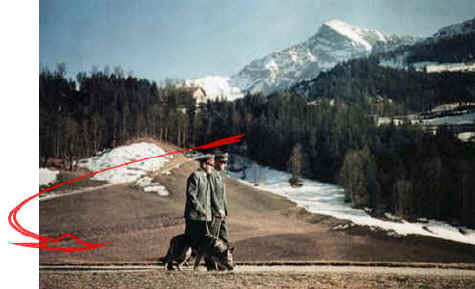 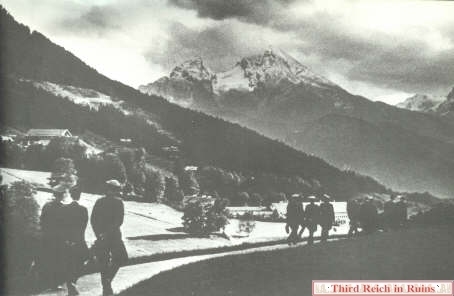 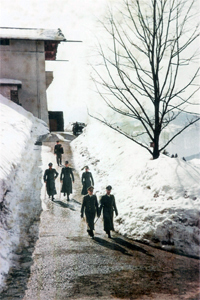 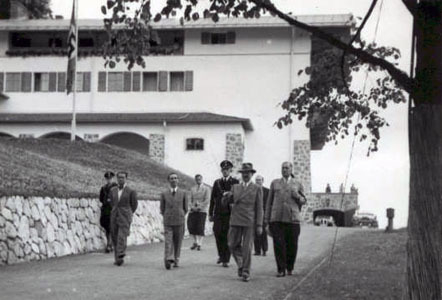 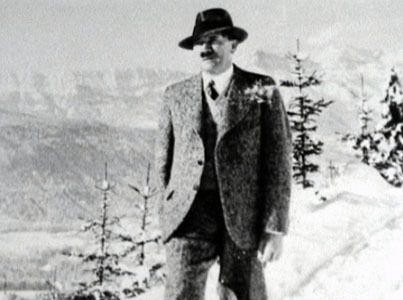 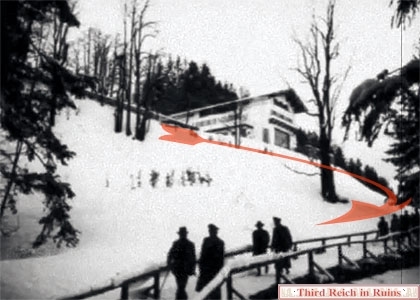 Still with Speer and Hitler walking clockwise back to the Berghof (Gutshof?). 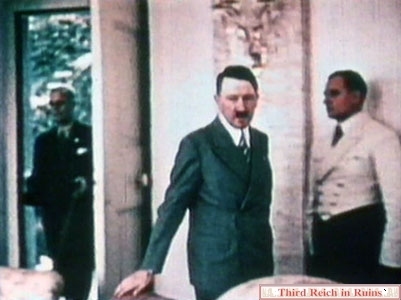 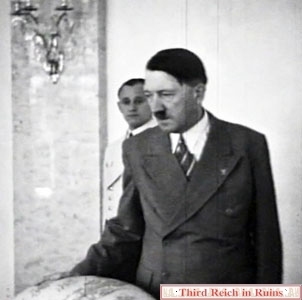 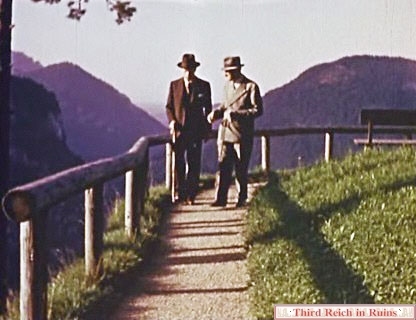 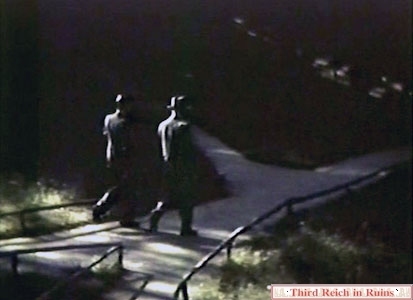 Hitler and Walter Hewel (one of Hitler's few personal friends) walking counterclockwise to the Mooslahnerkopf Teehaus (still from Eva Braun's movies in the U.S. National Archives). 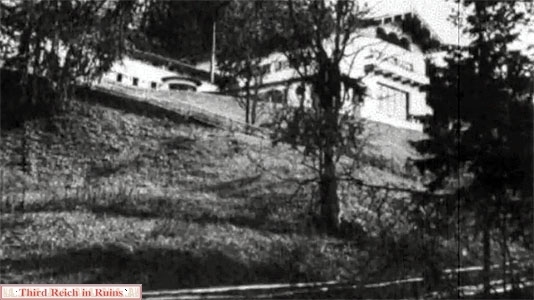 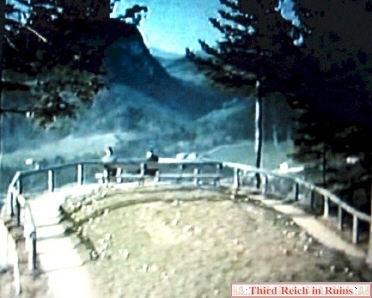 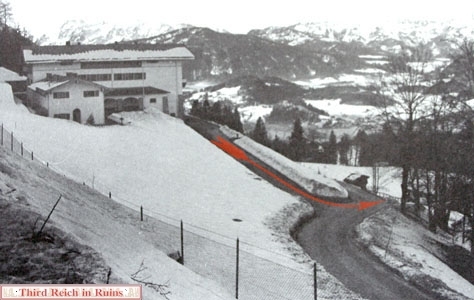 Same part of the route seen from another perspective: the terrace of the Berghof (the path along the grassy hillside in the background was the Teehaus route - stills from Eva Braun's movies). 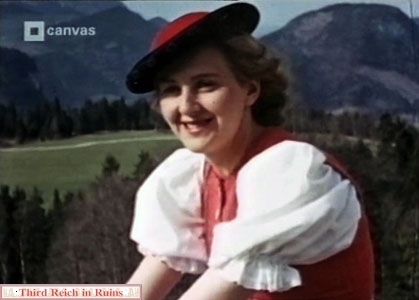 These four photographs are stills from Eva Braun's movies in the U.S. National Archives. 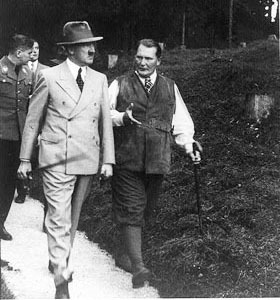 The woman on the right was an actress named Else von Möllendorff. 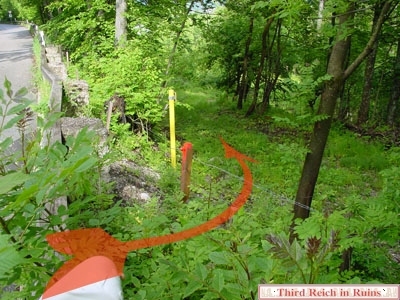 This is likely the exact location (Hitler must have been on the "green route" - see below). 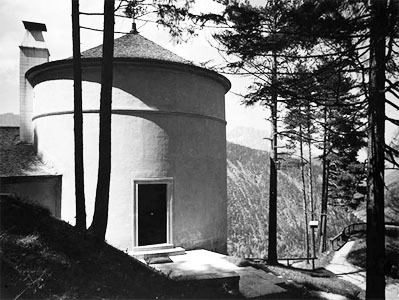 The Mooslahnerkopf Teehaus. 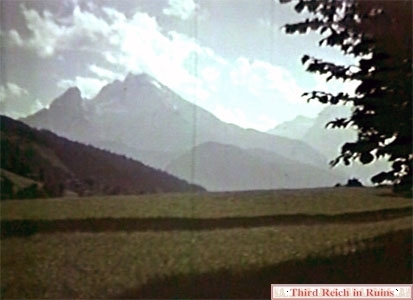 The famous overlook can be seen in the right background. 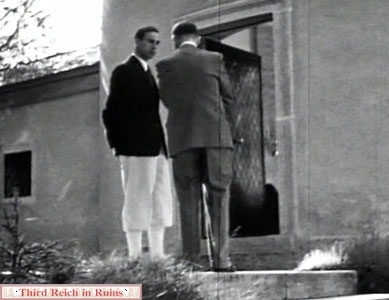 Hitler (in front of the entrance of the Mooslahnerkopfhaus) talks with Dr. Karl Brandt. 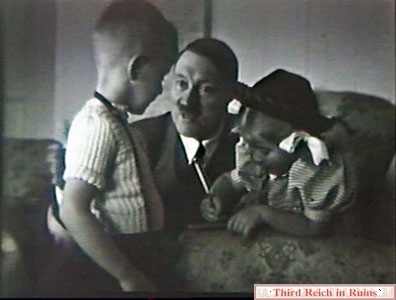 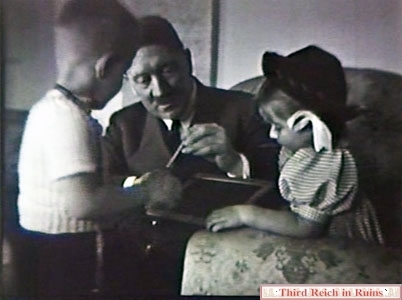 Hitler talking to children in the Mooslahnerkopfhaus (these four photos are stills from Eva Braun's movies in the U.S. National Archives). 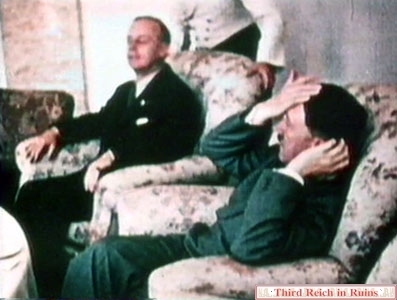 Hitler with Foreign Minister Joachim von Ribbentrop in the Mooslahnerkopfhaus - stills from Eva Braun's movies. 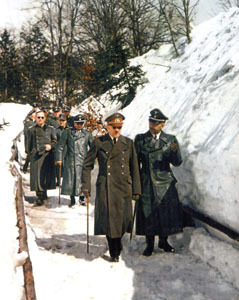 Hitler with Joachim von Ribbentrop. 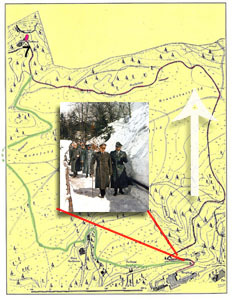 Hitler takes an "alternative" route and walks clockwise to the Mooslahnerkopf Teehaus; the green route on the map at the top of this page, and the aerial photo below. 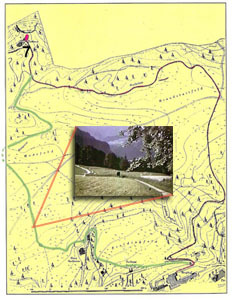 This path went past the Villa Bechstein, and across the Gutshof meadow (modern golf course). 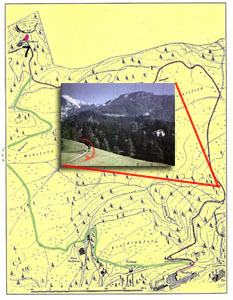 The Teehaus routes marked on an aerial photograph taken ca. 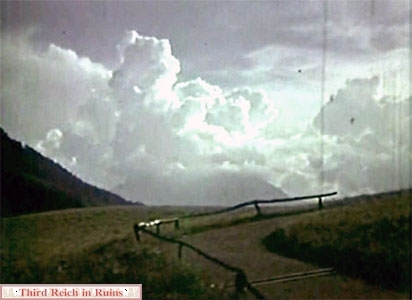 26 April 1945, after the bombing of the Obersalzberg. 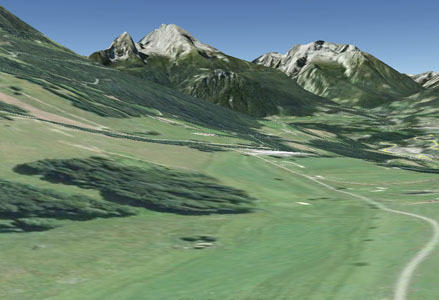 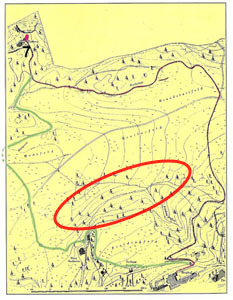 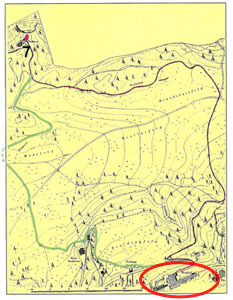 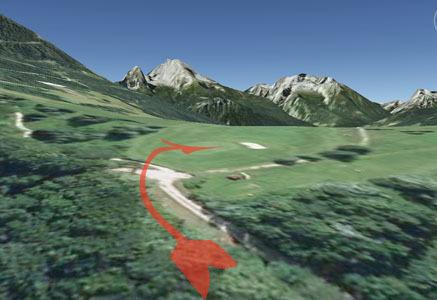 Both paths start at the Berghof, in the lower right center, and the Teehaus is circled in yellow at the upper left. 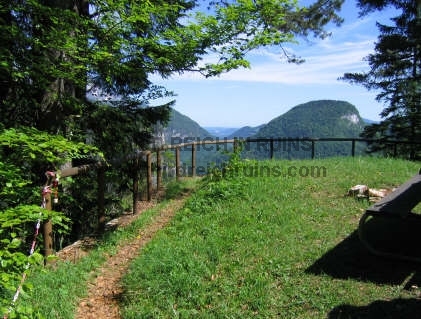 The path runs along the hill towards the Watzmann. 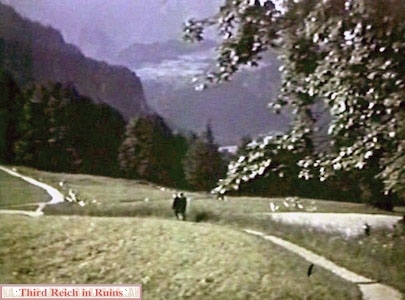 Note: the light seen at the end of the track in the distance, is a car (still from Eva Braun's movies in the U.S. National Archives). 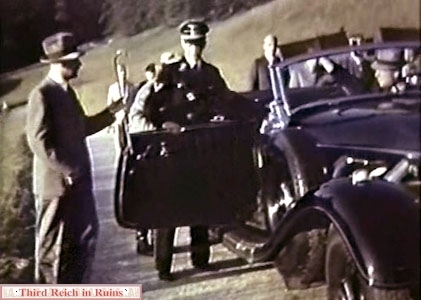 The above mentioned car (from the opposite side) that picked them up. 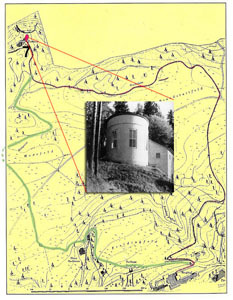 Continue to other Obersalzberg sites - Hitler's Berghof, Bormann's and Göring's houses, Platterhof, Gästehaus and Kampfhäusl, Hotel zum Türken, Kehlsteinhaus, SS barracks, bunker system, miscellaneous buildings, other miscellaneous area buildings, area Flak Battery positions.